Are Temporary Tables or Table Variables Quicker in SQL? The advice becomes a bit repetitive, since it repeats after 3 rows. The idea is to ensure we have a couple of reasonably authentic columns of data. 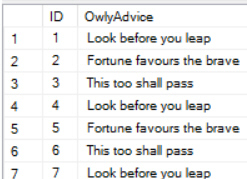 Given the advice will be randomly generated in equal amounts, the frequencies should be similar!